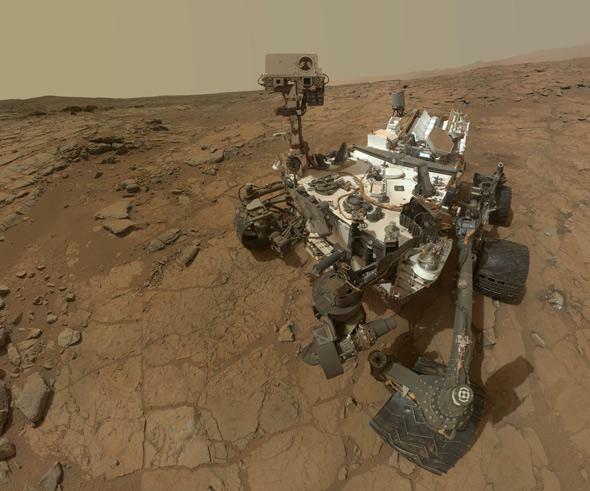 Mars Curiosity: Celebrating two years on the red planet. Curiosity took this self-portrait in 2013. Click to hugely enaresenate. I haven’t written about our laser-eyed nuclear-powered red-planet roaming friend in a while. But the Curiosity rover recently celebrated its second year on Mars (which is really just over one Martian year on Mars). It’s still rolling along—literally—heading for its ultimate target: Aeolis Mons, aka Mount Sharp, the 5.5 kilometer-high peak in the center of Gale Crater, Curiosity’s landing site. Of course, it’s finding a lot of fun souvenirs along the way, and doing amazing science. Caltech put together a nice video as a retrospective of the past two years, as well as a look forward to what it will do soon. It’s narrated by a couple of folks who might sound familiar, too. I won’t give it away (but it’s on the YouTube page show notes). Nice. I have a public lecture I give about Curiosity, and it’s one of my favorites to give of all time. The human effort that went into building, launching, landing, and using this machine is nothing short of Herculean, and still it marches on. It’s a triumph, and I quite seriously choke up during the talk every time. I’m so proud of what we can do. Congratulations to everyone who is involved with Curiosity and also to those who are building the 2020 rover too. Whenever I see Mars in the night sky, I see it as more than just a red dot: It’s an entire world, and one we’re just now starting to explore.